As part of its series Ready for His Close-Up: The Films of Billy Wilder, the Pacific Film Archive screened three of his films over the weekend. I caught them all. I was delighted to discover that this Ernst Lubitsch-directed comedy was part the Wilder series. We should celebrate Wilder the writer as much as Wilder the director. To my mind, the PFA pays far too little attention to screenwriters; I don’t believe they have ever done a series on a particular filmmaker noted primarily for writing scripts. This was my first big-screen Ninotchka experience. I had seen the movie only once before, by myself, on Turner Classic Movies. This was a big improvement. The Saturday 6:30 screening was well attended, and the audience came ready to laugh. The PFA screened the film on what appeared to be an excellent 35mm print. I say "appeared" because the PFA’s website says it was a DCP. It sure looked like film to me. Within two years of its release, the Soviet Union–the primary target of the film’s satire–would be our brave ally in the war against Hitler. The star, Greta Garbo, would also be a has-been by then. After Ninotchka, she made only one more movie. Garbo plays the title character, a loyal Russian and even more loyal Communist, who comes to Paris to supervise three bumbling comrades representing Moscow in a jewelry sale (the jewels were confiscated from aristocrats). But once there, she meets a charming man (Melvyn Douglas). She’s also charmed by the luxuries of capitalism. This was Garbo’s first comedy (the ads proclaimed "Garbo laughs! "), and she’s wonderful in it. She plays Ninotchka initially as a stereotyped, joyless, humorless ideologue, but she melts into a warm human being. And throughout it all, she displays the comic timing of a vaudeville veteran. The movie is clearly anti-Communist (my favorite line: “The last mass trials were a great success. There are going to be fewer but better Russians.”) But it also depicts the Russian aristocracy in exile as vain, shallow jerks with serious entitlement issues. From my TCM viewing, I gave Ninotchka a B. Now I’m promoting that to B+. I can’t tell you how many times I’ve seen Some Like it Hot, in 35mm, 16mm, broadcast TV, Laserdisc, DVD, and Blu-ray. The last time I saw it theatrically–before this weekend–was a disappointing screening some years ago at the Cerrito, with a lukewarm audience and a 35mm print was looked like it had lost a fight with the shredder. 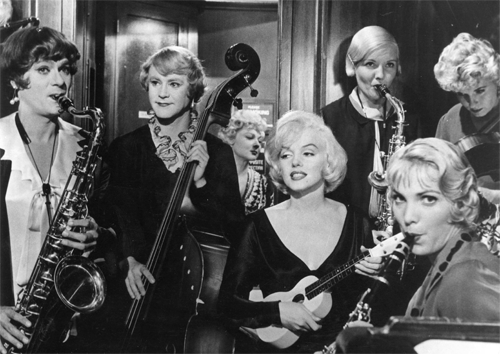 But Saturday night at the PFA, Some Like it Hot played as it should. The DCP looked crisp and clear, without sacrificing the film look. And the audience loved it. The laughter was consistent almost throughout. I’ve already written a Blu-ray review, so I won’t go into detail about the movie. I will say that it’s quite possibly my favorite non-silent comedy. Using a gangster situation to drive its men-in-drag plot, it mines deep belly laughs from gender roles and expectations. Two starving musicians (Tony Curtis and Jack Lemmon) witness a gangland massacre, then hide out from the mob by dressing up as women and joining an all-girl band. But the band’s lead singer is played by Marilyn Monroe, who tends to bring out their masculinity. This was a great way to revisit a beloved and funny masterpiece, one that I gladly give an A+. Btw, here’s an interesting coincidence about the two movies screened Saturday night: They both starred iconic leading ladies: Greta Garbo and Marilyn Monroe. And each one was that star’s penultimate completed film. I first saw The Apartment on a rented Laserdisc some twenty years ago. I’d seen it several times since, but always at home. Sunday night was my first time seeing it on the big screen. 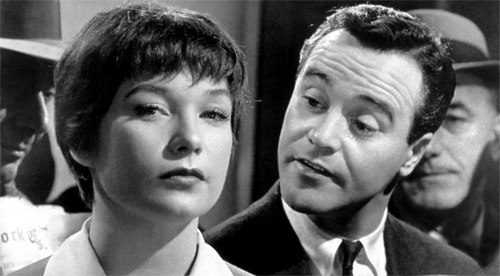 I wrote about The Apartment extensively in my Blu-ray review, so I’ll summarize quickly: Deftly balancing comedy and dead-serious drama, Wilder examines the way powerful men exploit both women and their male underlings. Jack Lemmon gave one of his best performances as a very small cog in the machinery of a giant, New York-based insurance company. In order to gain traction in the rat race, he loans his apartment to company executives—all married men–who use it for private time with their mistresses. Fred MacMurray plays the top exploiter and Shirley MacLane the woman he exploits and Lemmon loves. Seeing it with an audience is a treat. It doesn’t provide the steady rumble of laughs that Some Like it Hot generates. But the laughs come almost simultaneously with gasps of concern and horror. Wilder makes us laugh at sexism and exploitation, while reminding us that it’s not a laughing matter. This may be Wilder’s only film with role models. Lemmon’s neighbors, a doctor and his wife, are sensible, kind, loving human beings. (They’re also, interestingly enough, unquestionably Jewish.) Their concern for others is never mocked. The PFA screened The Apartment off a DCP. It looked fine, but not exceptional.